Now that I am home and have had a chance to edit my photos I’ll post them. Saturday was a beautiful sunny day. Good thing I had a change of riding jackets to deal with the change in temperature from morning to afternoon. Here is the Pennsylvania/Maryland state line. 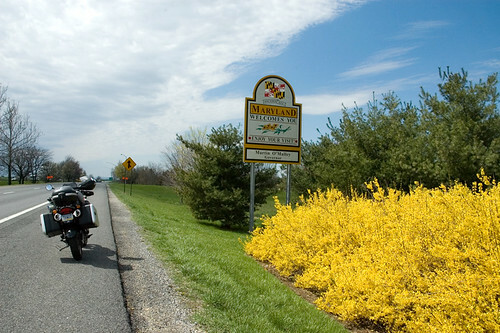 I absolutely love Maryland. It’s a beautiful state with beautiful roads. I wanted to stop and take a photo of every state I entered but the sign for West Virginia was on a bridge and I had traffic behind me. And the sign for Virginia? Well, to be honest I don’t even remember seeing one. I stopped for a break from the wind and asked the lady in the gas station what state I was in and she told me I was in Virginia. People sure have accents in Virginia. After another stop in Virginia I met up with this crew. 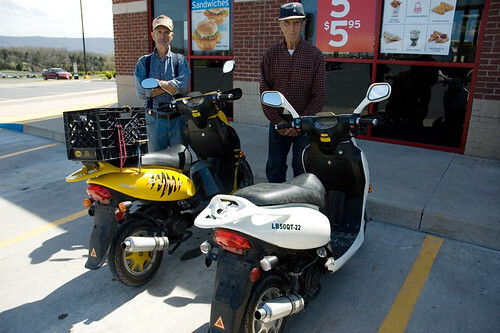 They are brothers and live just down the road from this gas station. They asked where I as heading and suggested a road just over the hill that runs parallel with I81. I took that road for a while. It was a nice country back road. Not unlike 944 which runs through Cumberland County back towards home in PA. But after a while I came across a “Bridge Closed” sign and I started to lose sight of I81. So I headed back to the highway and decided to deal with the crazy cross-winds. Yet another rest stop along I81. The cross-winds were really wearing me out physically. There really wasn’t a lot of big truck traffic and when there was, it didn’t really bother me. I think the constant riding with no idea where I would actually stop for the night and the cross-winds were the cause of my exhaustion. All along I81 are signs for Roanoke, Virginia. At first it was about 190 miles. And I knew from looking at my Atlas earlier in my trip planning that Roanoke was in southern Virginia. For some reason it just struck me as a good place to call it a day. 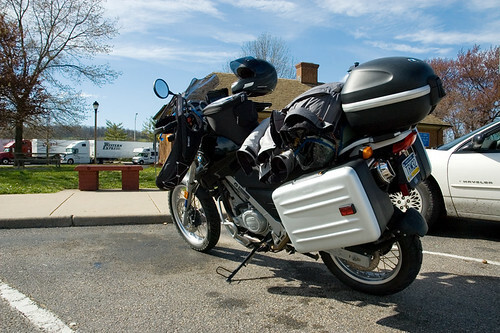 After finally getting to Roanoke, Virginia I pulled into a gas station and brought up hotels on my GPS. 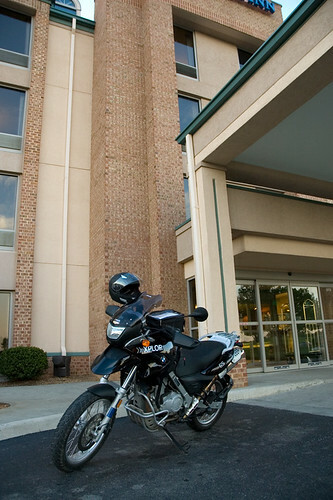 I also had a list of hotels that offered discounts to AMA (American Motorcycle Association) members. A Comfort Inn came up and was only a few miles away. Off I went towards the hotel. I pulled in front of the door and asked if they had a room. The answer was yes. Did they offer the AMA discount? No. I didn’t care, I was exhausted, not thinking clearly, and extremely hungry for something besides a power bar. As I was unloading the bike the guy from the front desk came out for a smoke break and to talk to me. It was a cool moment because if I were traveling by car there would have been no more interaction besides getting my room. But the fact that I was on a motorcycle sparks interest and conversation. I asked him where I could get a good meal and he said the steak house just down the street was the best in the area. So after my bike was unpacked, I got a shower and headed over. Bread for starters. 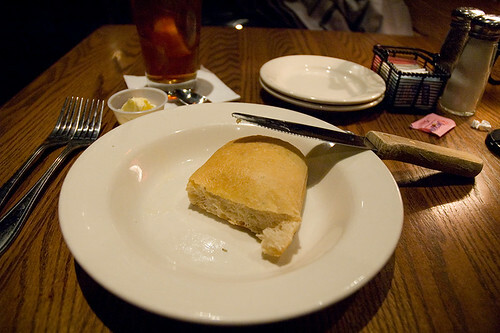 But like anyone who is starving, this was the best bread I have ever had! I ate it all before my meal arrived. Then my meal arrived. Crab cakes, baked potato, and rice. 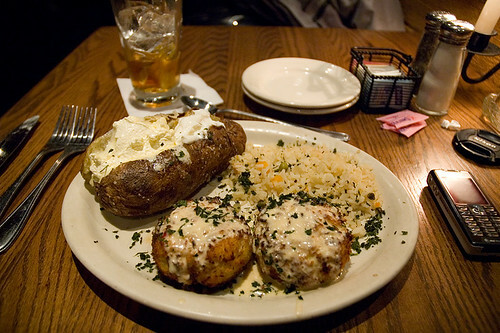 Ok, ok… my mom and probably even my co-worker Barrie will say “Why did you order a baked potato and rice?”… hey, I didn’t really care, I was just hungry! Notice the sweetener packets on the table. I think I had about 5 glasses of iced tea. It tasted so refreshing after drinking a mix of Gatorade and water out of my hydration pack all day. Oh yeah, Jason, if you’re reading this… that was my fix for iced tea for the weekend ok! After a big meal like that I headed back to the hotel to do some serious thinking about this trip.